On a damp, drizzly evening in Port of Spain, the Signal Hill Alumni Choir is in full flight. They’re performing at an open-air concert at the Queen’s Park Savannah, and apart from the poor weather, the audience of hundreds has also had to endure a 45-minute delay. Worse still, the nondescript opening act has done nothing to lift the evening’s soggy vibe. Since this is the start of Emancipation celebrations, the wet crowd is wearing elaborate African dress. Yet all this is now forgotten. After a selection of powerful West African songs and some sprightly Tobago folk tunes, Signal Hill launches into the final number, “Oil and Music”. The singers break down the soca hit by David Rudder and Machel Montano and rebuild it with dynamic multi-part harmonies. Wedded to the choir’s trademark choreography, the performance is dazzling. For the choir and its artistic director John Arnold, after 25 years of doing what they do, it’s all in a night’s work. “The audience seemed to enjoy it,” is his modest assessment when we meet backstage afterwards. A well-fleshed man with a commanding presence, Arnold has been in charge of the Signal Hill Alumni Choir – SHAC to its friends – since its inception in 1984. 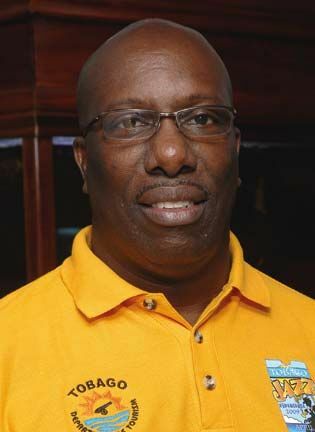 Growing out of the folk choir at Tobago’s Signal Hill Senior Comprehensive School (which counts football star Dwight Yorke as an alumnus), SHAC dominated the folk-music class of the national Music Festival throughout the 1980s. 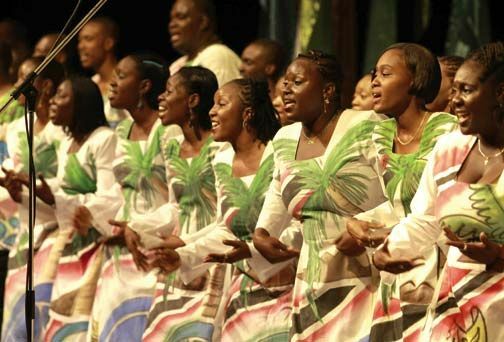 The choir retired from competition in the early 1990s, by which time it had evolved from merely a local-folk chorale to a choir that performs gospel, African folk and world music, as well as reggae and calypso. Numbers by the Mighty Shadow and David Rudder are part of its impressive repertoire. Whatever style SHAC performs in, one thing that remains constant is the choir’s mesmerizing dance moves, the “choral choreography” for which it is known. It’s also a nice way to make one’s name, not only locally, but worldwide too. SHAC has toured throughout the Americas and Europe, and performed for Archbishop Desmond Tutu of South Africa and Queen Elizabeth II, among others. The choir has also competed internationally, and in 2001 placed second in the folk category at the Wales International Choral Festival. It’s been honoured with one of Trinidad and Tobago’s national awards, the Hummingbird Medal Gold, and it has a significant discography, including a two-CD collection of its best work. After 25 years, John Arnold can declare that what keeps SHAC alive is “passion and leadership.” He characterises his leadership style as “democracy mixed with a bit of dictatorship,” noting, “People like to be led.” But it’s passion that matters most in the choir’s continued success – passion for music, passion for the island of Tobago, passion for leaving a legacy.